This article discusses a semantics issue of a Unicode character. Yesterday, i sent 6 hours researching a song: Yoko Kanno - Moon. It's a song from a Japanese animation titled 《∀ Gundam》, which is read as “Turn A Gundam”. 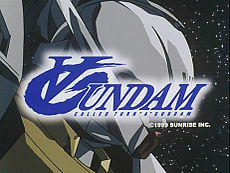 Turn A Gundam title screen. Note the V merged with G, with G being part of the word Gundam. However, on Wikipedia they used the Unicode char ∀ (U+2200; FOR ALL), not Ɐ (U+2C6F; LATIN CAPITAL LETTER TURNED A). So, i spend a total perhaps 30 min on this issue, researching on the issue of which of the two Unicode character is more proper. Does the story carry any sense of “For All” in any way? As in “For All Gundam”? If so, then the math symbol should be used. Yes, a petty detail, not really important. However, it's important in the same sense that some artist care about every detail of her work. Not all artists or designers are like that, and such meticulousness doesn't necessarily contribute to greatness of a work. However, for some artist, every detail matters. That's me. 2012-01-05 Maiko Kinzel Engelke told me that the upside-down A should be the math For All symbol, because “the Turn A Gundam is something like the Last Gundam, the one where all technology would be united in one.”. Also confirmed in a comment i posted to Wikipedia discussion, by Benjamin Howard Lee (aka MythSearchertalk) of Hong Kong 2012-01-02, quote: «Well, the motif of Turn A Gundam is to include and conclude all Gundam series, thus it is taking the “For all” meaning of Turn A.» Thanks guys.